June 1, 2016 – The University of Colorado Boulder is among seven university teams selected by NASA and the National Space Grant Foundation to design systems, concepts and technologies that will help improve NASA’s exploration capabilities, including the habitation systems astronauts will need for the agency’s journey to Mars. 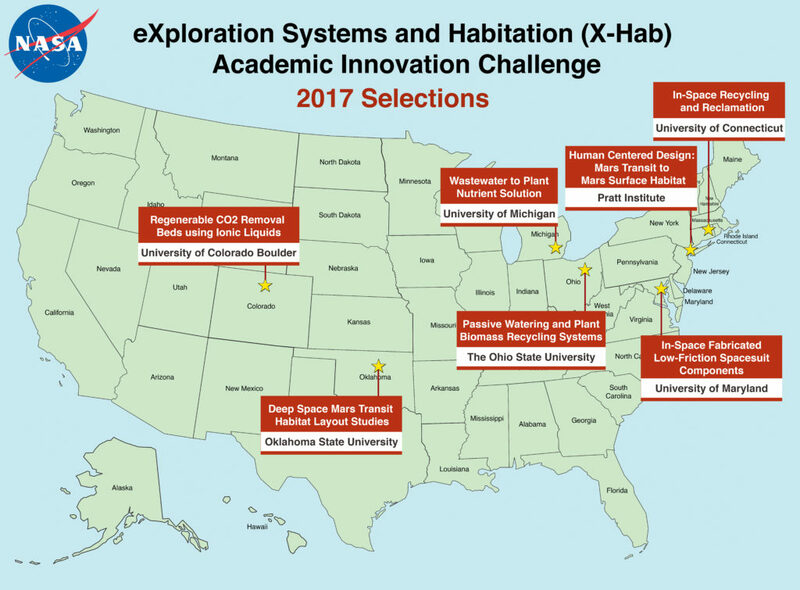 The selections are part of the eXploration Systems and Habitation (X-Hab) 2017 Academic Innovation Challenge, and include proposals to advance 3-D printing capabilities, improve spacecraft environmental recycling systems, further develop plant growth systems and create conceptual habitat designs. The university teams will have the academic year to develop the proposed systems and structures into functional prototypes and ensure that the projects are consistent with their senior- and graduate-level design curricula while emphasizing hands-on design, research, development and manufacturing. Throughout the year, they will complete engineering design reviews and will provide three project status briefings to NASA before presenting their final prototypes for evaluation in May 2017. 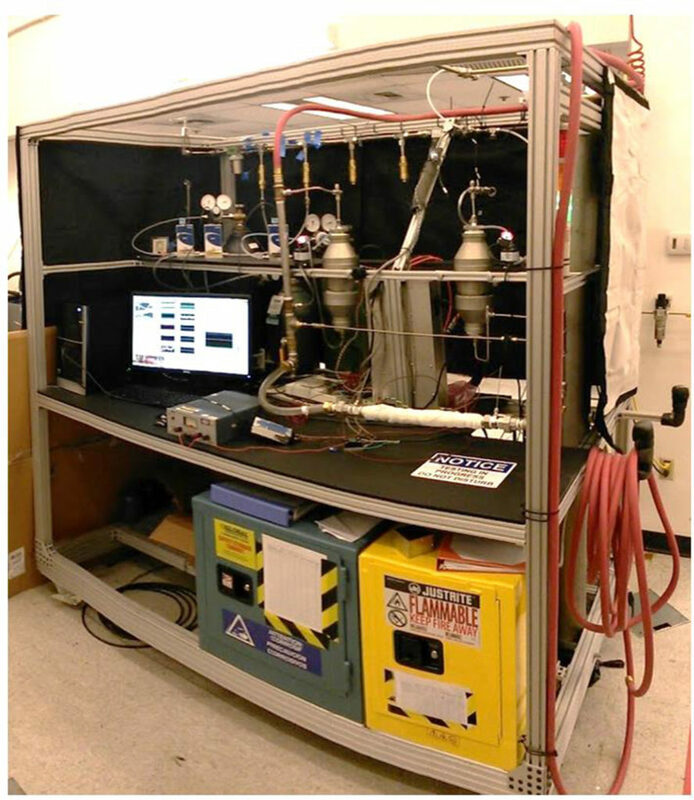 The University of Colorado team will develop, test, characterize, and optimize the size and shape of carbon dioxide (CO2) removal beds. Using vacuum and thermal cycles, the project will assess and improve upon the limitations of CO2 removal bed absorption and desorption processes. Elevated CO2 concentrations adversely affecting crew performance and may contribute to crew physiological issues. Advancements that are capable of lowering the levels of CO2 are critically enabling technologies­­ for the future of long duration human space exploration. Students also will study the effect of breakthrough curves, temperature profiles, and flow performance. The University of Connecticut team will develop performance requirements, system design, and an in-space recycling plan for an integrated 3-D printer/recycler that can manufacture and recycle polymer parts within a single unit. It will address form, fit, and function aspects of the parts being recycled throughout the part’s life cycle. This ability to reuse 3-D printer feedstock could significantly increase sustainability and reduce resupply needs during long duration space missions. The University of Maryland plans to develop and test technologies that utilize 3-D printing to construct the rigid elements of pressurized spacesuits. The project intends to rely almost entirely on additive manufacturing technologies to construct suit components that contain low-friction joints, bearings, rotary seals, and pressure seals. The design of low-friction joint and bearings is an essential area of research in 3-D printing that could lead to various other applications for space exploration. The Pratt Institute will bring together the two disciplines of architecture and industrial design to identify, design and prototype the unique, shared, adaptable and recycled elements of the kitchen and sleeping pod from their previously designed X-Hab Mars in-space transit habitat concept. The elements requiring little to no redesign will be used to create a kitchen and sleeping pod in a concept for a Mars Surface Habitat. Oklahoma State University students will design, build and evaluate components for horizontally and vertically oriented habitats for deep space missions. The project will continue ongoing work to build a complete habitat mockup for use in research and education, namely the Stafford Deep Space Habitat (SDSH), which includes NASA’s Multi-purpose Logistics Module (MPLM), the Martian Reconfigurable Habitat (ReHAB), and the Organics and Agricultural Sustainment Inflatable System (OASIS), The team will design and construct the communications, controls and environmental systems to integrate the SDSH and the ReHAB. Building on previous X-Hab challenge projects, The Ohio State University will further refine their water delivery system improvements for NASA’s Vegetable Production System (Veggie) on the International Space Station. This year’s work focuses on ensuring water capillary transport by eliminating air bubbles in the water column between the water reservoir and the plants while allowing sufficient root oxygen levels. The project also will evaluate the feasibility of recycling plant biomass as soil to reduce the need to launch it from Earth. The University of Michigan team will design a wastewater treatment system for crew operations, selecting between a system for use in-orbit (microgravity) or one to be used on the surface of a lunar or planetary body (low gravity acceleration). The team will outline requirements and system definitions, materials science, electrical and computer engineering, environmental sensing and control, biological monitoring, fluid and gas flow, human factors, and space systems engineering trade studies. Student teams submitted proposals in early 2016, and their selection kicks off a year-long process covering the 2016-2017 academic year. Project teams will work toward a series of milestones to design, manufacture, assemble and test their systems and concepts in close cooperation with members of NASA’s Human Exploration and Operations Mission Directorate. NASA staff from the Space Life and Physical Sciences Research and Applications and Advanced Exploration Systems divisions will work with students in areas including additive manufacturing, advanced life support systems, space habitation and systems for food production in space. The X-Hab Academic Innovation Challenge supports NASA’s research efforts to enable sustained and affordable human and robotic space exploration while contributing to the agency’s commitment to train and develop a highly skilled scientific, engineering and technical workforce for the future. The National Space Grant Foundation will administer 2017 X-Hab grants of up to $30,000 to the universities on behalf of NASA. These funds will support each selected team’s 2016-2017 academic year efforts to design and develop the prototypes for evaluation.